"Improper Land Clearing Can Destroy the Internet"
This article here is really a reflection on how humans use to clear land back in history in replication of what they saw and observed in the natural world around before the invention of all things mechanized. Perhaps these alternatives have been long since forgotten by most folks, but many are bringing them back again. Once again, out in the Natural World there has always been a major component of land clean up and maintenance for which today is sadly breaking down or in some locations on Earth it's completely absent. Proper land custodianship hasn't always worked with most conventional science-based Industrial Agricultural and Forest Land Management practices which usually seek to find or make a fast Buck ($$$) quick fix solution as opposed to replicating long term ecological solutions which from an imperfect human standpoint may not have an immediate Dollar Value attached to these ideas, but does have long term life sustainable investment returns. Hopefully folks reading this will get a clue with all sorts of lights turning on in their heads as to the possibilities that are out there. So let's consider some historical perspectives on land clearing and maintenance. Ever see old paintings of those grandiose landscapes of famous European Estates owned by the wealthy of eras long past ? Or how about the earliest paintings of some of the most famous of large city parks in both America and throughout Europe ? 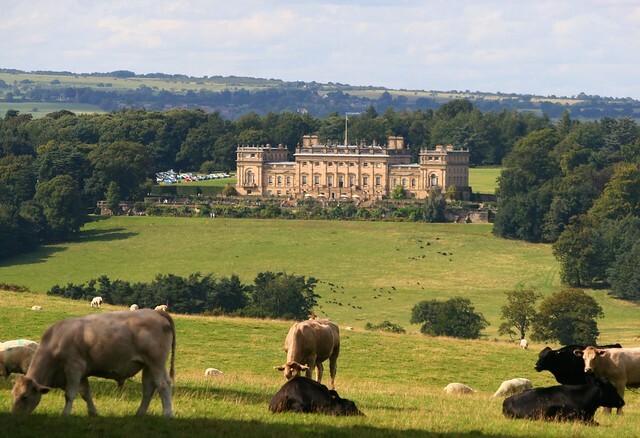 Ever wonder who or should I say what cut and edged those 'as far as the eye can see' lawns depicted in those paintings ? It was quite often sheep which were a natural part of Public Parks and Estates back in those times before the introduction of mechanical devices which replaced the sheep. Sheep were often a common feature in those paintings, but maybe often overlooked by the viewer who may never once considered why they were present. 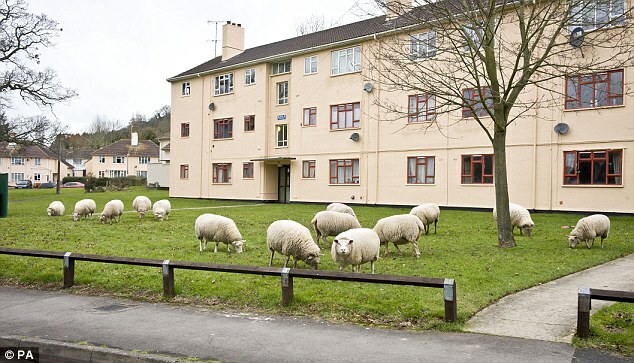 We certainly don't have sheep in our public parks or estates today, so what was their purpose for being in the painting. I dare say most folks viewing those works of art never give it a second thought, let alone thinking or wonder about them in the first place. Let's take a historical look back. History can be an amazing educator. around the immediate vicinity of the Estate residence itself. Even a resident Kitty was curious. Wool-Kommen! White House Grounds Maintenance Crew ! 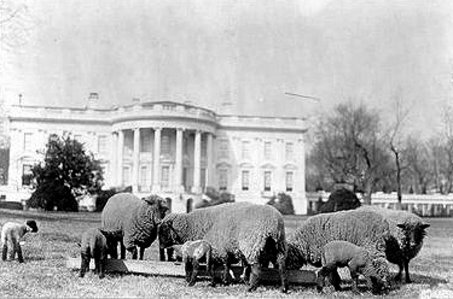 For further historical reading on the use of sheep, here is a link to an historical look at the fascinating way America use to maintain their public works. Here are some modern day applications being done right now. It's a shame more modern farms do not follow this example! 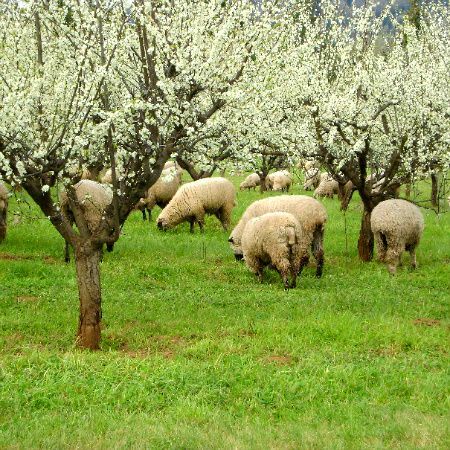 Sheep grazing in an Orchard not only keeps the grasses and other annual grasses and other plants in check, but also prevents soil compaction from heavy farm equipment which is better for root growth along with it's mycorrhizal grid and those added natural fertilizer pellets. •Grazing on the cover crop avoids soil compaction from farm equipment which is detrimental to root growth. 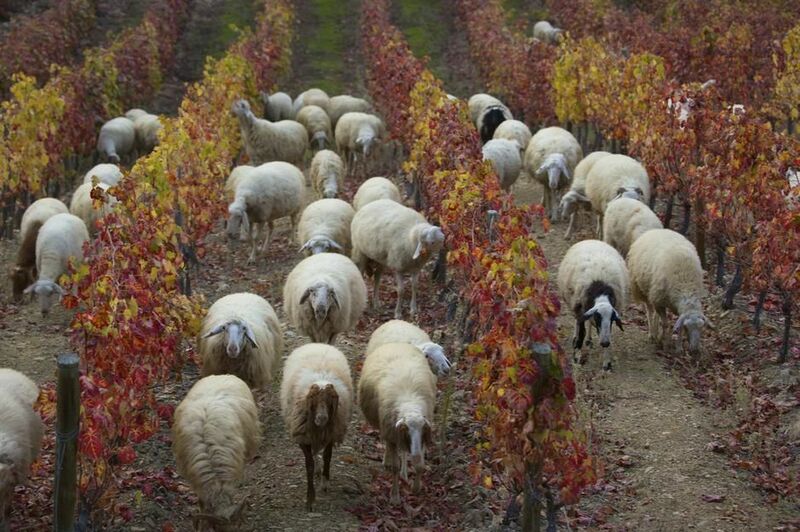 •Sheep are natural recyclers: their manure helps fertilize the root system of the vines. •Along with bees and chickens, their presence increases biodiversity on the ranch. A major goal in any biodynamic program is to create a farming environment that is as self-sustaining as possible. At JPV we are currently farming 140 acres biodynamically, and it is our goal to eventually become 100% biodynamic." The photo above is a picture of sheep grazing Vineyards in Douro River Valley - Portugal. Even with a shepherd, Goats would make a not so wise choice for gleaning the fields between Trees in an Orchard or Grapevines in a Vineyard. They will eat everything in site and that despite the watchful eye of an attendant. However, they are perfect for Chaparral maintenance and thinning dense growth zones as in firebreaks. When I lived in Anza, CA, there were several people who used goats to maintain their land without destroying the environment and disrupting the underground mycorrhizal Grid or network. 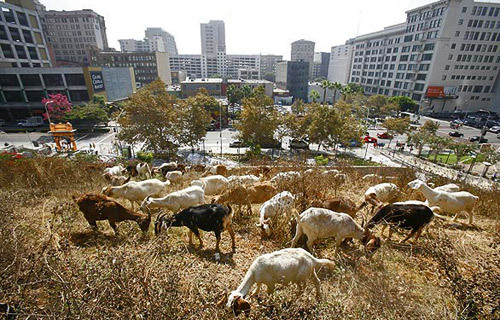 Of course like anything, goats need to be managed and moved around so as not to overgraze an area down to the soil. In historical times past various predators did this service by keeping the herbivores on the move. A prime example of ecosystem improvement was in Yellowstone when the wolves keep the Elk moving which in turn allowed for willow, alder and other Riparian Habitat plant community establishment. Recovering Riparian Plant Communities with Wolves in Northern Yellowstone, U.S.A.
Another modern day practical applications practice is that of using pigs to clean the understory of a forest floor where the large herds of Bison, Elk and Deer were the wildlife components of the ecosystem, but have since been removed from this natural system. Take the example of Joel Salatin of the Shenandoah Valley in Virginia who uses his pigs to initiate temporary disturbance to his forest soils for a month, then allows 11 months of natural rebuilding by the ecosystem. Below in the next video - Joel Salatin talking about pigs ability at land disturbance and management that makes the ecosystem of the forested lands more valuable. His pigs perform what formerly now extinct herds of Bison , Elk and Deer moved along by predators like wolves, Grizzly Bear, Mountain Lions pushed them along to do in forest floor management. Video below is of the Star Rose Ranch using Joel Salatin's Pigerator Method for turning compost and weeding the surrounding area. Two weeks later and the farmer didn't need to life a finger. As a final video and conclusion here, this is a visit by Joel Salatin to on the central coast of California for a ranch visit with Janina Pawlowski and Doniga and Erik Markegard from the Markegard Family Grass-Fed cattle operation. Joel describes how to divide pasture land based on key lines as well as how to manage pasture with seasonal dry conditions. Now pay close attention to what he is suggesting. Often times new ideas need repeating if nothing else than for your own education. Repetition for Emphasis is important along with personal practical application of the suggested ideas. Even when you make mistakes, view these as learning experiences. Trust me, as a land owner you will make some mistakes, but if humble enough to take much needed advice you'll eventually come off a winner. Pay close attention to what he says about viewing and learner your own land. When anyone buys a property they want to develop as a farm, ranch, orchard, vineyard or just a simple nature hideaway retreat, take one year and just get to know it. When I lived up in Anza, California, you find the weather is extremely different from down along the coast or even interior valleys at the lower elevations. Rainfall totals for winter are far more than below along the coasts. Learn the runoff patterns of the water on your land, if any at all. Get to know your geology. Some areas should be left alone. One example in the video Joel gives below are some steep difficult areas for farming or grazing. Leave those alone and allow either the chaparral or forest to grow back. Or if already present, simply leave them alone. 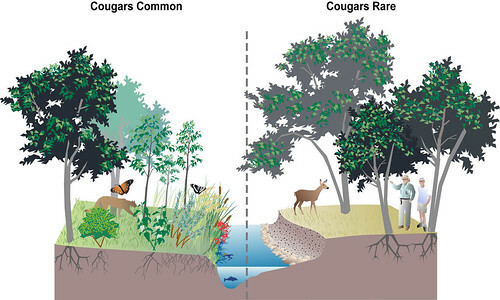 They serve wildlife habitat functions and remember hydraulic - lift - redistribution and descent ? These areas can be allow to regulate and administer water intake by percolation in your soil as facilitated by the mycorrhizal grid and intertwined roots systems of the rocky site. Every portion of your land can have purposeful function if you are smart enough to understand how things in nature can actually work for your advantage if you work with and not against. Those are great scenes of how land management happened before mow-blow operations. And land clearing! I wish the land were the client when regulations or designs and practices were put into place. Great post! You wouldn't believe how landscaping is done over here. It's often so wet that a leaf blower is useless. Grass on lawns is never collected and discarded. So unsightly lumps and chunks are left out in plain sight, even at the Göteborg Bontanical Gardens. The only thing that saves is that it is so regularly wet that bological forces break down the grass before to long. Tree branches are piled up and left for months on the location they were cut, even if it is a city park or side of a roadway or someone's curb. Apparently it's to wet to run through the chipper - makes sense. I love alot of the Joel Salatin videos and papers he's written. There is a Jeol Salatin Polyface Farms Video Library that has been collected and put together on the Ron Paul website. I'm not political, but it is an easy reference if you want it. 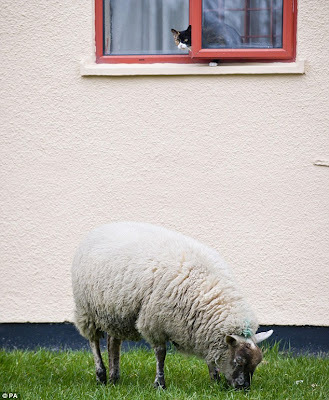 good idea to use the sheep as lawn mowers. I always want to do it, but it is not legal here in New Zealand. Wow, I never would have thought that about Eco-Promoting New Zealnad. Is that just in the cities or throughout the countryside ? This was the way things were done everywhere a 100 years ago. You get your lawnscape mowed and fertilized all on one service. Wish people knew how to take care of our green planet better. It doesn't take all the effort in the world or the will of 1,000 men to plant a few trees every now and then, and care for the nature around you. I'm hoping to do a article on when nature communications to us how to care for it. Like tree and shrub trimming. There are areas which literally say, 'detach here'.